Minute Maid Park is the site of the matchup between the Baltimore Orioles and the Houston Astros on Friday, May 26, 2017. The probable starting pitchers are Kevin Gausman for the Orioles and Joe Musgrove for the Astros. Baltimore opens at +135 while Houston opens at -145. The Orioles have a 22-21-2 over/under record and a 24-21-0 run line mark. The Astros are 27-20-0 against the run line and have a 23-21-3 over/under record. The Orioles have a 25-20 overall record this season. Starting pitcher Kevin Gausman has a 2-3 record with an earned run average of 6.65 and a WHIP of 1.86. He has 36 strikeouts over his 47.1 innings pitched and he's given up 66 hits. He allows 12.5 hits per 9 innings and he has a FIP of 5.23. The bullpen has an earned run average of 3.90 and they have given up 167 base hits on the year. Teams are hitting .262 against the bullpen and they've struck out 147 hitters and walked 70 batters. As a team, Baltimore allows 9.3 hits per nine innings while striking out 7.4 batters per nine innings. They are 18th in the league in team earned run average at 4.27. 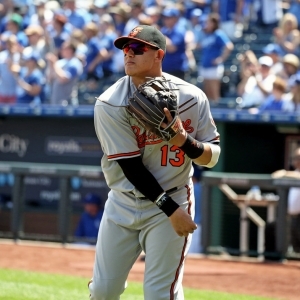 The Orioles pitchers collectively have given up 423 base hits and 194 earned runs. They have allowed 55 home runs this season, ranking them 14th in the league. Baltimore as a pitching staff has walked 175 batters and struck out 335. They have walked 3.9 men per 9 innings while striking out 7.4 per 9. They have a team WHIP of 1.46 and their FIP as a unit is 4.56. As a team Baltimore is hitting .254, good for 13th in the league. The Orioles hold a .424 team slugging percentage and an on-base percentage of .314, which is good for 23rd in baseball. They rank 8th in MLB with 9.0 hits per game. Jonathan Schoop is hitting .269 with an on-base percentage of .324. He has 42 hits this season in 156 at bats with 19 runs batted in. He has a slugging percentage of .462 and an OPS+ of 112. Adam Jones is hitting .263 this year and he has an on-base percentage of .308. He has totaled 49 hits and he has driven in 21 men in 186 at bats. His OPS+ is 97 while his slugging percentage is at .419. The Orioles have 405 hits, including 72 doubles and 65 home runs. Baltimore has walked 129 times so far this season and they have struck out 394 times as a unit. They have left 317 men on base and have a team OPS of .738. They score 4.6 runs per contest and have scored a total of 207 runs this year. Houston has a 31-16 overall mark this year. With an earned run average of 5.63, Joe Musgrove has a 3-4 record and a 1.55 WHIP. He has 37 strikeouts over the 46.1 innings he's pitched. He's also given up 55 hits. He allows 10.7 hits per nine innings and his FIP stands at 5.13. The bullpen has an earned run average of 3.29 and they have given up 112 base hits on the year. Teams are hitting .199 against the Astros bullpen. Their relievers have struck out 198 batters and walked 59 opposing hitters. As a team, Houston allows 7.5 hits per nine innings while striking out 9.8 batters per nine innings. They are 3rd in the league in team earned run average at 3.46. The Astros pitchers as a team have surrendered 354 base knocks and 164 earned runs this season. They have given up 58 home runs this year, which ranks 11th in Major League Baseball. Houston as a staff has walked 148 hitters and struck out 463 batters. They give up a walk 3.1 times per 9 innings while they strike out 9.8 per 9. Their team WHIP is 1.18 while their FIP as a staff is 3.79. As a team, they are batting .265, good for 8th in the league. The Astros hold a .438 team slugging percentage and an on-base percentage of .334, which is good for 7th in baseball. They rank 10th in MLB with 9.0 hits per contest. Jose Altuve comes into this matchup batting .297 with an OBP of .364. He has 52 hits this year along with 22 RBI in 175 AB's. He maintains a slugging percentage of .497 with an OPS+ of 141. George Springer is hitting .236 this season and he has an OBP of .315. He has collected 39 hits in 165 at bats while driving in 24 runs. He has an OPS+ of 112 and a slugging percentage of .442. The Astros as a unit have 422 base hits, including 77 doubles and 64 homers. Houston has walked 150 times this year and they have struck out on 339 occasions. They have had 312 men left on base and have an OPS of .772. They have scored 4.89 runs per game and totaled 230 runs this season. Who will win tonight's Orioles/Astros MLB game against the spread?